CoinEx, is a cryptocurrency exchange which was launched in December 2017 and has its headquarters in Hong Kong. It aims to build a highly secure, user-friendly, low cost and high-speed cryptocurrency platform to trade a wide range of cryptocurrencies by using its proprietary trade matching system. It supports multiple languages and accepts users from more than 100 countries. CoinEx exchange is not registered with any legislation yet. CoinEx has stated that it won’t be using the assets of the customers anywhere else and they are 100% reserved. Because of that, withdrawals are processed very fast and users will get their funds relatively quick within a few minutes. This CoinEx review will analyse several aspects to provide you with an all rounded detailed overview of the exchange and its services. Although Cryptimi does its best to provide you accurate info and to update it on regular basis, we strongly recommend that you to visit CoinEx.com for any updates which might occur afterwards. Since the CoinEx exchange is relatively new and no hack attempts have been made so far, it can be considered as safe. Even though the exchange doesn’t provide any advanced security features (like IP monitoring), it provides the basic 2FA option to protect the customer’s funds. Also, it makes use of the security factors like multi signature strategy and HTTPS to provide full-dimension protection for the customer’s funds and data protection. CoinEx is a global digital currency exchange service provider which can process up to 10,000 transactions per second using its high speed matching engine. Hence, it can quickly process cryptocurrency transactions so that users can deposit/withdraw funds within few minutes. On the CoinEx exchange it is not possible to purchase crypto with FIAT. CoinEx doesn’t have a full-fledged wallet like Coinbase. The CoinEx wallet can be used to deposit coins temporarily for trading. You will not be given access to your private key, but only to your public wallet address. It is highly recommended to use hardware wallets like Ledger Nano S or Trezor to store your cryptcurrencies. The wallet provided by Coinbase is also a good option to store Bitcoins and other altcoins for low volumes. 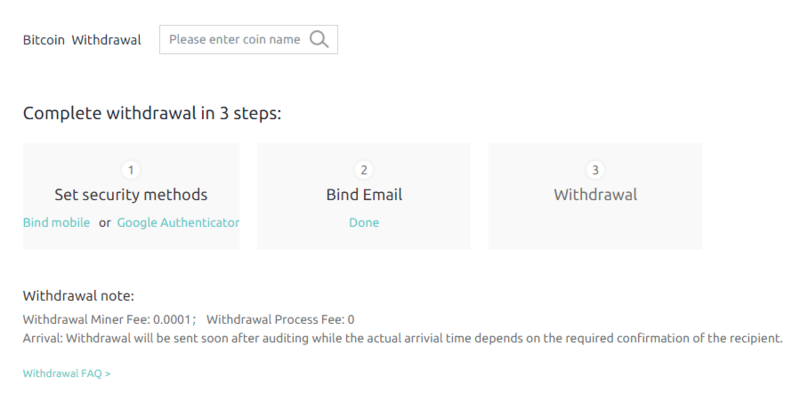 Creating an account on the CoinEx exchange is very simple and can be completed within a minute or two. As it has not set any geographical restrictions, anyone can create account on CoinEx by just providing the email address. In case users forget their password, it can be easily reset by entering the verification code received on their email after clicking the ‘Forgot Password’ link found on the login page. Navigate to their site and click the ‘Sign up’ link located on the top right of the page. Enter your email address, password and click ‘Get code’ button. Within a few minutes, you should receive the authentication code via email from the CoinEx team. 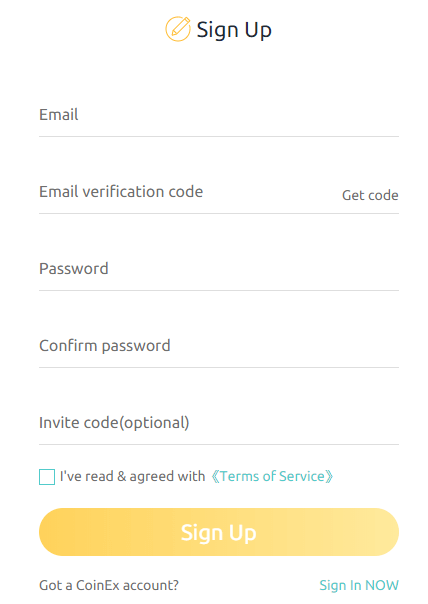 Enter that code on the field ‘Email verification code’ and click the ‘Sign Up’ button after agreeing to the terms to finish creating your account. Congratulations! You have successfully created your account on the CoinEx exchange. Navigate to their site and click the ‘Sign In’ link located on the top right of the home page. Once you complete the Captcha puzzle, you will be logged in to your account. CoinEx exchange allows users to start trading without submitting any kind of documents. 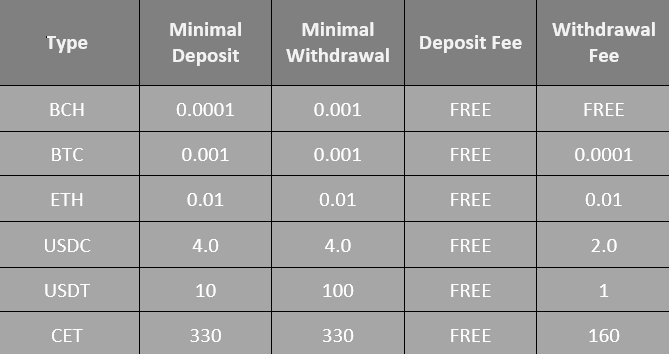 Even though it has not yet set any limits for deposits, the withdrawal limits vary based on the level of verification (Basic/Advanced). For Basic account verification, users must provide a valid ID issued by their government or a passport or a driving license, a selfie image holding the ID and a statement with the written text “CoinEx” together with the submitted date. The documents required for advanced account verification can be found out from your account page. To improve the security of the transactions, the exchange highly recommends the users to enable 2FA via SMS or GA (Google Authenticator) app. Login to your CoinEx account and click the ‘Wallet’ link located in the navigation bar. Enter the coin name (eg. BCH) on the box below ‘Asset portfolio’ and click the ‘Deposit’ link. Now, you must enter this address on the wallet or exchange from where you are sending the coins. If your wallet has a mobile app, then you can use the QR code to insert the address. Once your transaction gets confirmed on the blockchain network, the funds will be available on your CoinEx wallet which can be used to buy other altcoins or cryptocurrency tokens. Users can exchange/trade all the leading cryptocurrencies like ETH, ETC, LTC, XRP and much more from the CoinEx exchange. Currently, it doesn’t support fiat based payments. The only option to buy digital currency is to deposit BCH, BTC or other coins supported by the exchange. Hence, users must buy BTC or BCH from some other exchanges (like Coinmama, Coinbase or CEX.io) before starting to trade on CoinEx. This example shows how to buy Bitcoin (BTC) using Bitcoin Cash (BCH). It is assumed that the user has already deposited BCH on the CoinEx account. Login to your CoinEx account and click the ‘Trade’ link located in the navigation bar. Enter the value of BCH you would like to exchange or the amount of BTC you would like to buy and Click the ‘Buy BTC’ button. Congratulations ! You have placed your first order for BTC. Once your transaction gets completed, BTC will be available on the wallet. You can view the status of your order in Order History. This example shows how to buy Ethereum (ETH) using Bitcoin (BTC). It is assumed that the user has already deposited BCH on the CoinEx account. Follow Step 1 mentioned on the section how to buy Bitcoin. Enter the value of BTC you would like to exchange or the amount of ETH you would like to buy and Click the ‘Buy ETH’ button. Congratulations ! You have placed your first order for ETH. Once your transaction gets completed, ETH will be available on the wallet. You can view the status of your order in Order History. 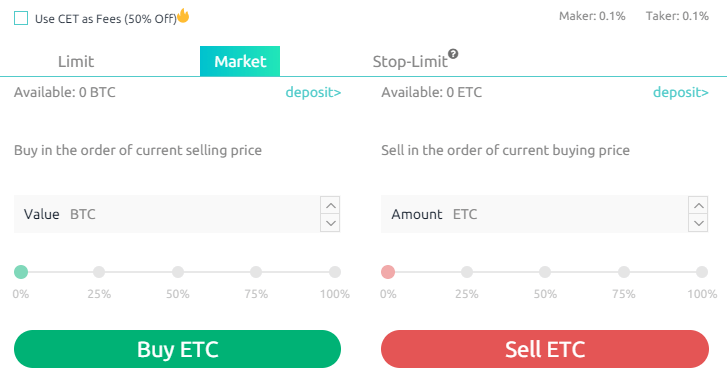 This example shows how to buy Ethereum Classic (BTC) using Bitcoin (BTC). It is assumed that the user has already deposited BCH on the CoinEx account. 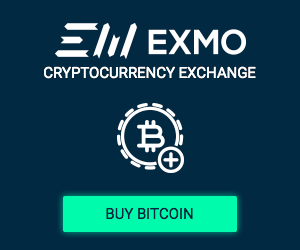 Enter the value of BTC you would like to exchange or the amount of ETC you would like to buy and Click the ‘Buy ETC’ button. Congratulations ! You have placed your first order for ETC. Once your transaction gets completed, ETC will be available on the wallet. You can view the status of your order in Order History. This example shows how to buy Litecoin (LTC) using Bitcoin (BTC). It is assumed that the user has already deposited BCH on the CoinEx account. Enter the value of BTC you would like to exchange or the amount of LTC you would like to buy and Click the ‘Buy LTC’ button. Congratulations ! You have placed your first order for LTC. Once your transaction gets completed, LTC will be available on the wallet. You can view the status of your order in Order History. This example shows how to buy Bitcoin Cash (BCH) using Bitcoin (BTC). It is assumed that the user has already deposited BCH on the CoinEx account. Enter the value of BTC you would like to exchange or the amount of BCH you would like to buy and Click the ‘Sell BTC’ button. Congratulations ! You have placed your first order for BCH. Once your transaction gets completed, BCH will be available on the wallet. You can view the status of your order in Order History. You will not be able to cash out with FIAT currency from CoinEx however you are able to send the funds over to another exchange or wallet. The withdrawal limit varies based on the level of verification (Basic/Advanced). CoinEx has also set a minimum withdrawal amount for every cryptocurrency. To know the exact values, simply scroll down to the bottom of their landing page. Before placing the withdrawal request, users must ensure that their amount is greater than the minimum withdrawal amount. 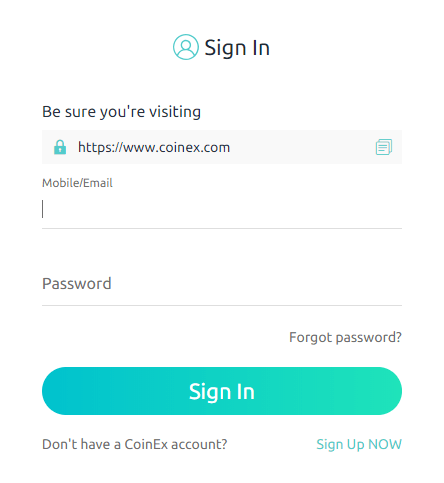 Login to your CoinEx account and click ‘Wallet’ link on the navigation bar. Enter the coin name on the box below ‘Asset portfolio’ and click the ‘Withdraw’ link. Select the tab ‘Normal Transfer’ and enter the valid withdrawal address of your wallet/exchange. Enter the amount of withdrawal. If you have enabled 2FA, enter the authentication code and click the ‘Withdraw Now’ button. 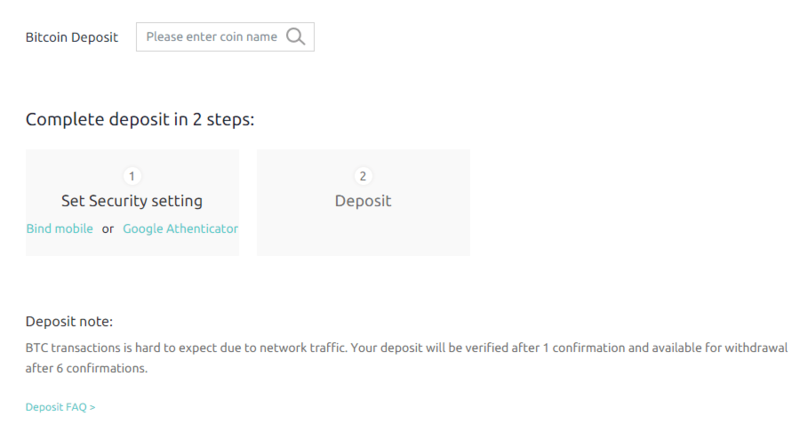 Once your transaction gets completed, the coins will be sent to the given address. The status of your withdrawals can be checked from the order history. CoinEx exchange allows its members to buy a large number of altcoins and cryptocurrency tokens. Bitcoin (BTC), Ethereum (ETH), Litecoin (LTC), Ethereum Classic (ETC), Bitcoin Cash (BCH), Dash (DASH), Ripple (XRP), Monero (XMR), Cortex (CTXC), EOS token (EOS), Zcash (ZEC), Golem (GNT), Qtum (QTUM), NEO (NEO), Bytom (BTM), 0x Project (ZRX), USD Coin (USDC), Tether (USDT), CoinEx Token (CET), Banyan Network (BBN), Bitcoin Unlimited (BTU), Bitcoin Candy (CDY), CyberMiles (CMT), DACC (DACC), Decred (DCR), Dogecoin (DOGE), Egretia (EGT), eosDAC (EOSDAC), FuzeX (FXT), Hydro Protocol (HOT), Hshare (HSR), Hydro (HYDRO), BitKan (KAN), Linfinity (LFT), Loom Network (LOOM), MassGrid (MGD), Nano (NANO), No BS Crypto (NOBS), OneLedger (OLT), OmiseGO (OMG), RChain (RHOC), Seele (SEELE), SEER (SEER), SoPay (SOP), TokenClub (TCT), TRON (TRX). CoinEx exchange accepts users from all countries in the world including the UK, EU, US, Australia, and Canada. Every cryptocurrency exchange will have its own fee structure and limits and CoinEx is not an exception. CoinEx exchange works on the maker/taker model and charges a flat fee of 0.1% per trade. If the user is paying the transaction fee by using the token issued by CoinEx named CET, then a 50% discount will be applied towards the fee. CET is the proprietary token of the CoinEx exchange. The exchange doesn’t deduct any fee to deposit coins. On the other hand, it charges a withdrawal fee for all the altcoins and cryptocurrency tokens available on its platform, except for BCH. 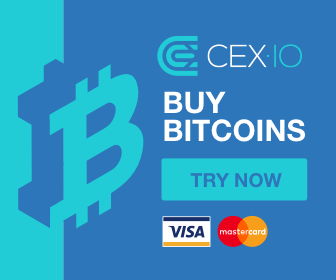 For BTC CoinEx has a 0.0001 BTC withdrawal fee, which is approximately €0.50. For the full list of fees click on this link and scroll to the bottom. The 24-Hour withdrawal limit on CoinEx varies depending on the verification level of your account. The limit is 10000 USD if you have added either your mobile number or Google Authenticator whereas the limit is 1,000,000 USD for basic verified accounts. For advanced account holders, there is no 24-Hour withdrawal limit. Currently, CoinEx exchange supports only crypto-to-crypto trading. It doesn’t accept fiat payment methods like credit/debit card, SEPA transfer etc. If you would like to buy cryptocurrencies instantly using credit/debit card, then you can try exchanges like Changelly or Coinmama. Coinbase is the best exchange to buy altcoins via bank or SEPA transfer. To prevent unauthorized access, CoinEx exchange offers 2FA protection via SMS or Google Authenticator so that the transactions will not get completed without entering the TOTP (Time Based One Time Password). If SMS support is not available for your country, then you must use the Google Authenticator app to receive the authentication codes. In addition to 2FA, the exchange transmits all the data and information over a secure HTTPS network. Also, CoinEx ensures the maximum protection to its customer’s funds by storing them on cold storage wallets. 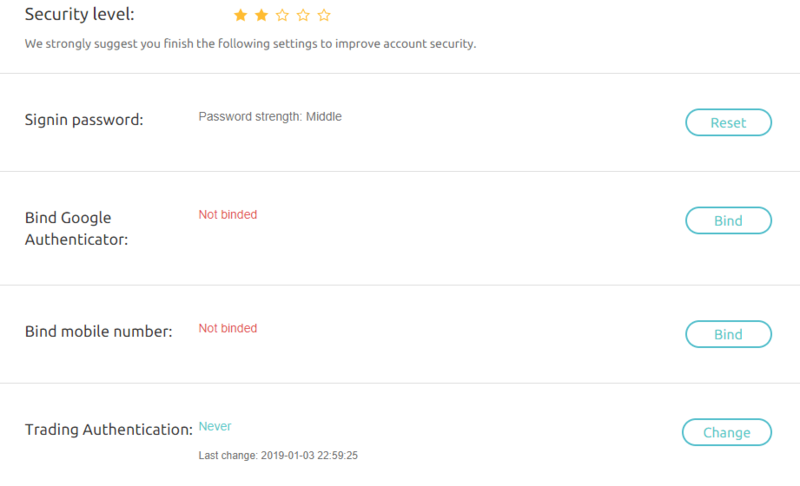 CoinEx exchange suggests the users to create strong passwords for their accounts. It shows the strength of the password like weak, medium, good or very good, so that users can make changes accordingly. To generate a highly secure password we recommend checking out this site. Should you experience any issues with your account, the only method to contact their support team is by submitting a ticket by scrolling down to the bottom right-hand corner and selecting ‘ticket’ in the the Support section. For general queries, the users can refer to the FAQs found in the same section available on the CoinEx website. To trade/exchange cryptocurrencies on the go, users can download the CoinEx mobile app which is available for both iOS and Android platforms. It is expected that CoinEx exchange will add support for fiat currencies very soon. An advantage for CoinEx users is that they can remain anonymous and save time from not submitting documents. Because of its high-speed trading engine, users can quickly make deposits/withdrawals. So much so that the exchange claims that small withdrawals will be processed in less than 5 minutes. Regarding fees, CoinEx deducts only a nominal maker/taker fee. The only drawback of CoinEx is the lack of support for fiat currencies.